Charlottenlund Fort isn’t just an old military fort. It is also an exciting and beautiful park with a popular swimming beach and bathhouse. It lies between Charlottenlund Forest and the Sound, and its open green spaces provide the setting for a host of leisure activities. It affords opportunities for sunbathing, play, ball games, picnics and a dip in the waves of the Sound. The fort was built below Charlottenlund Palace as part of the fortifications around Copenhagen in the years 1886-88. In 1910 it was converted into a regular søfort and was one of the forts designed to protect Copenhagen from attacks from the sea. There was erected a high embankment around the whole area and dug a 30-40 feet wide and 3 feet deep moat. One can still see the old cannons on the ramparts and the remains of the dense scrub, which should protect against invaders. Today, both the fort and its surroundings at the beach park is a popular recreation area, which has been used for the organization of concerts. Inside the fort area behind the ramparts is a campground, and the violence on the Øresund catering establishment. The park outside the fort itself is dominated by large, open græsfælleder with single trees and small garden spaces framed by close-cropped hedges, where to find some rest and enjoy your picnic. For beach park located Charlottenlund Søbad, which is a beautiful, private bath house that receives summer guests for a small charge. 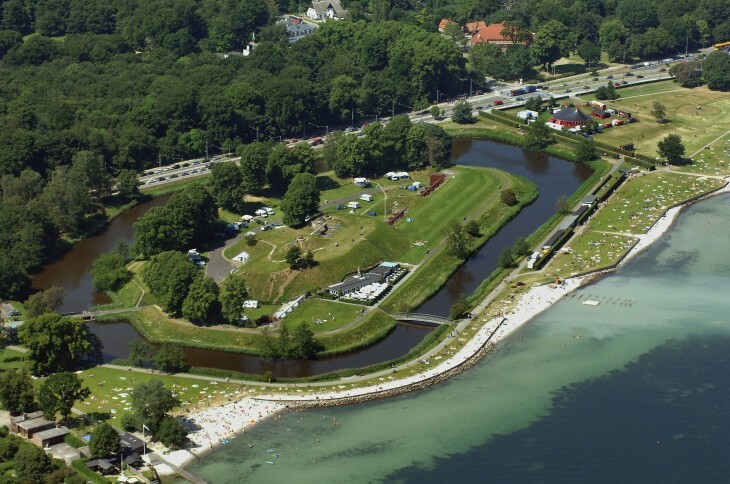 The beach was originally part of Gentofte Deer Park, established in 1622 by King Christian IV. Later, Gyldenlund took possession of the land. When Charlottenlund Palace was built on the site in 1886, Crown Prince Frederik – later King Frederik VIII – leased the northern section, razed the park and divided it up into vegetable gardens. The fort and the park have been public since 1932. Rock concerts were once held at the fort but these were stopped as a result of complaints from local residents. Opera is still staged here though. Reeds, broadleaf bullrush, yellow iris, plain meadowsweet, grey willow, alder, hairy willow herb, loosestrife, gipsywort, water mint, bittersweet nightshade and bent grass. There is a restaurant and an ice-cream stall.